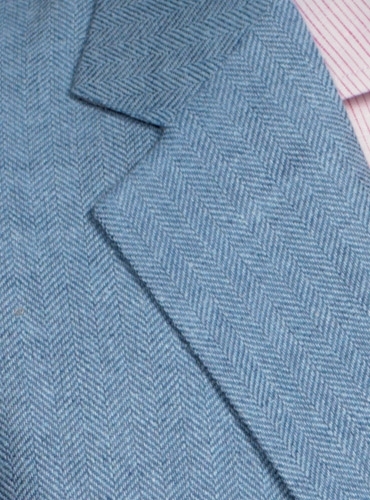 We have woven this elegant and classic tone on tone blue herringbone fabric in Scotland. The subtle cobalt and regal blue “bone” is 50% silk and 50% linen. We have cut it in our American workroom in a full range of sizes, and tailored it in a trim natural shoulder silhouette with a fully canvassed and lined two-button front, and trim 3" lapels, center vent, and double pipe and flap lower pockets. 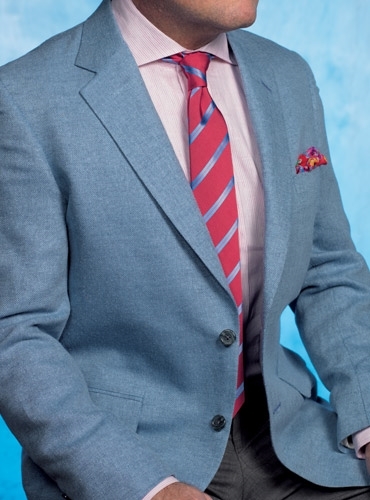 Tropical wool trousers in light grey complement the jacket well.